Comminution technology has been advancing quickly in response to the increasing burden entrained solids have placed on wastewater treatment facilities. More advanced devices have been developed in rapid succession. The result has been an exciting and fluid race between the leading manufacturers to develop the best size reduction device. Recently, the latest grinder innovation that has been introduced unleashes the power of twin shaft grinding to handle massive flows of wastewater with an entirely new operating principal. Since the 1950s, each decade has seen the development and installation of a new breed of solids reduction (comminution) devices. Each major new development contributed a set of improvements in performance. Over time many of these units have evolved and found specialized applications where they excel. In spite of marketing claims, no one design has provided a total solution for all applications. Comminutors are designed to capture and tear solids to small pieces so they can be more easily processed by downstream equipment while allowing the flow to pass through. Of late, the pace of development and innovation has accelerated markedly, especially as related to twin shaft wastewater grinders. These units use two counter-rotating banks of intermeshing cutters to cut and shred solids to fine particles. The shortfall of this design has been its limited ability to pass fluids due to the fact that the bulk of the cutting area in this design is closed to liquid flow. In the 1990s the flow capability of twin shaft grinders was enhanced by the addition of rotating plastic or multiple disk screens. These acted to direct solids towards the cutters while allowing fluids to pass through. A problem with this design has been that the solids do not obediently travel to the grinder in a turbulent channel flow. Instead, they can rush past the cutting area and bypass cutting completely. The result is reduced grinding effectiveness. All grinders and comminutors are designed to capture and tear solids to small pieces so they can be more easily processed by downstream equipment while allowing the flow to pass through. Over time, various design approaches have been introduced, and in some cases re-introduced. Comminutors (a.k.a. grinders, macerators) are used to reduce the particle size of wastewater solids. The terms "sewage grinder" and "comminutor" are two terms for a cutting device for sewage solids. The term "comminutor" originated with a device for chopping meat. It was later applied to equipment used for reducing pharmaceuticals and wastewater. The term grinder, as in meat grinder, is commonly used to imply a comminutor that reduces solids finely and often has multitudes of cutting edges. However, this is a loose terminology. There are units that finely reduce solids with only a few working elements. The original sewage grinders, installed as long as 30 years ago, were all called comminutors. As a testament to their durable design, many of these machines are still in service to this day. However, owing to a lack of maintenance and poor parts availability, they are in disrepair. In response to operators' frustration with these units, manufacturers refrain from calling their current offerings comminutors. But most people skilled in this art agree that comminutor is the valid term for this type of device. An important use for comminutors (grinders) is in the primary treatment of raw sewage solids in plant headworks and pump stations. Large, stringy solids can easily plug even supposedly "non-clog" pump impellers and necessitate the use of size reduction devices. In sludge, inline grinders are often installed ahead of pumps in recirculation lines and also to enhance the operation of dewatering equipment, digestors and nozzles, which can easily become plugged. Belt filter presses and centrifuges are especially sensitive to oversized particles that can puncture filter membranes, reduce their efficiency or damage expensive centrifuge drums. As a result, grinders can easily pay for themselves in damage and downtime prevention and the reduction of maintenance. Large, stringy solids can easily plug even supposedly "non-clog" pump impellers and necessitate the use of size reduction devices. Comminutors are commonly employed where it is undesirable, impractical or uneconomic to remove solids due to the lack of disposal options. Even when screening equipment is employed, some solids inevitably slip through, so the use of a comminutor is useful as a backup. Alternatively, some plants find it desirable to put the solids through the plants' digestion processes and thus require size reduction equipment and not screening. Sewage comminution dates back to the 1950s with the introduction of the bottom discharge comminutor. This unit featured a rotating drum with attached cutter teeth. 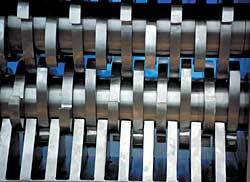 Solids would get caught on and rotate with the drum and get reduced as the teeth passed through a fixed comb. This design featured a large active screen area and heavy construction. The drawbacks of this unit's design included: a bottom discharge that required a special "L" shape channel construction, trouble handling certain solids, the rotating drum was subject to wear from bottom grit and the teeth were extremely difficult to remove to service. The straight-thru comminutor, introduced next, employed an oscillating cutter to wipe a semi-circular screen surface clear and sweep and cut the solids against vertically mounted stationary cutters. This design featured easier maintenance and a straight through configuration. The drawbacks were the screens were light gauge screens, weak and subject to puncturing. The unit was incapable of handling the increasingly heavy solids encountered over time, and a lack of power at the end of each stroke could cause the unit to jam excessively. A variation on the straight-thru design was later introduced with heavier solids reduction capability, rotary cutting design as opposed to oscillating and a heavier screen design that required no adjustment. This unit is today typically used to easily replace and upgrade older straight through comminutors or where operators desire the ability to easily replace the cutters without disassembling the machine or prefer to not use seals at the channel bottom. The first machine to address the problems of reducing troublesome solids directly inline was the pipeline delumper. Originally developed in the 1960s for the chemical process industry, this pressure rated unit quickly became invaluable to treatment plants. It could reduce heavy solids directly inline and improve flow properties of the system thus reducing maintenance problems for operators. The Delumper was the pioneer inline processor that helped treatment plants with a difficult and previously unsolved maintenance problem. After the U.S. Navy in the early 1970s adapted the pipeline delumper as the wastewater processor of choice for its frigate fleet, a competing inline comminutor was introduced with a twin shaft design. This unit adapted and miniaturized a German twin shaft solid waste shredder's mechanism. Others subsequently also started marketing this design for municipal applications. Twin shaft grinders use two slowly counter-rotating shafts with intermeshing cutter disks. As one cutter passes the opposing cutter at close clearance it shears solids trapped between the two and passes them downstream. This design provided good dry solids reduction and feeding capability due to its lineage as a solid waste shredder, which have been supplied with up to 300 hp motors for reduction of everything from steel drums and tires to construction debris. The drawbacks of these miniaturized shredders for liquid waste systems were poor ability to pass liquids. They were also excessively complicated assembly due to the use of multiple individual cutter and spacer disks. Another problem was the possibility of cutter stack collapse and disk cracking as every thin cutter was dependent on every other one for its position in the stack. Even when screening equipment is employed, some solids inevitably slip through, so the use of a comminutor is useful as a backup. With cutter cartridge elements, multiple individual cutters and spacer disks were replaced by a one-piece solid element. The advantage of this design was increased cutter strength and the elimination of a multitude of small gaps between the cutters with its associated problem of stack loosening. This design has been found to improve twin shaft units by reducing individual cutter parts and increasing unit strength. The cutter cartridge design has been found to provide more reliable performance and is often used to retrofit twin shaft units with old individual cutter disks. This unit features a bi-directional cutting operation, heavy solids handling, abrasion resistant hard-faced cutters and stainless steel cutter construction. It excels at handling high flow rates with a minimum of headloss. As it only has two cutting elements, it is simple to maintain. The design uses the flow to help in feeding the unit, so it is best applied to applications where the flow velocity is greater than two feet per second. To improve the flow capability of twin shaft units, various flow "diverters" have been employed to move solids to the grinder while allowing flow to bypass the grinder. In the later 1980s, the diverter concept was again introduced. Several units implemented flat diverter screens such as the "disc screen" which employed multiple parallel banks of rotating disks to convey solids to an adjacent grinder. Another design re-introduced the drum screen with an adjacent grinder. While these designs increased the flow capability of their grinders, they also had a number of drawbacks. Flat screen or disc designs were subject to "plastering" or bridging of solids across the screen. Screen wear against bottom grit was problematic. Also, solids tend to get trapped within the screen center. Solids could also bypass the grinder altogether, as these units have no way to assure that the solids don't escape in the gap between the screen and the grinder. In the drum type screen, only 1/4 of the screen can be active as the rest rotates in the wrong direction or doesn't feed the solids effectively. This results in increased headloss. Rover, developed by Franklin Miller Inc., features a new design that handles higher flows than previous units and avoids the pitfalls of the previous units as well. The newly designed grinder mates the power of twin shaft grinders with effective fine screening. In this unit, a grinder actually travels back and forth across a semicircular sizing screen to intercept and grind the solids to a size that must be fine enough to pass through the screen slots. Oversized solids are continuously recycled back through the grinder for further reduction. The unit's screen is positioned across the entire unit so there are no gaps through which unprocessed solids can pass. As the screen is positioned behind the grinder, it acts like an industrial solids classifier to re-circulate oversized particles back to the grinder for further processing. This design assures a high level of effectiveness and a completely processed output. The unit uses a stainless semi-circular screen. This design eliminates the possibility of trapping of solids as occurs with screen drums. Even in the event of a power outage, the unit may be automatically restarted without the need for the operator to manually clear out imbedded debris. In fact, unit's twin shaft grinder has an excellent screen sweeping capability and has the ability to self-clear its screen, even if solids have accumulated during the outage. An important criterion in choosing a grinder is hydraulic performance. Can the unit be placed in the flow without raising the head excessively to the point of backing up the system or cavitating the pump? For this, it is important to work closely with the manufacturer in sizing of the unit to the application. In general, a more open design will pass more flow and cause fewer backups than a unit with a higher percentage of closed area. Is the manufacturer well established with broad experience in the field? Will the design handle the present and future flow capacity without excessive upstream head? Is the design easy to maintain in the given installation? Is the unit built for long term reliability and ease of maintenance? Is the unit built with materials that are resistant to the corrosive or abrasive conditions of your flow? Is the unit capable of handling the specific solids encountered in your system such as industrial waste or institutional solids, such as particularly heavy solids encountered downstream from correctional facilities? This article originally appeared in the October 2001 issue of Environmental Protection, Vol. 12, No. 10, p. 12.